A classic load from a company that has done a bang-up job of re-creating one of the best performing military rounds of all time, and doing so, accurately to the 1980’s and 1990’s military surplus ammunition that American shooters have such a taste for. This is the 122 grain hollowpoint variant of this load, with the other loads offered being a 122 grain FMJ and a 124 FMJ and hollowpoint respectively. There is a negligible difference between the performance of any of these cartridges from a functional perspective. 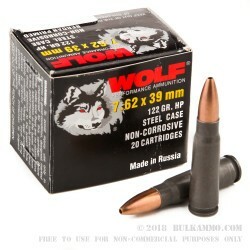 The hollowpoints offer a better hunting round clearly; and the price is very close. 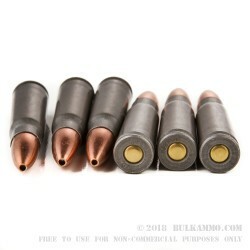 What is important for these rounds to understand is how good they are for all applications in the caliber and with any platform of firearm generally widely available. The cyclic reliability and the feeding and extraction is very consistent. 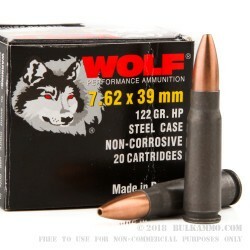 The bullet performance and terminal ballistics are very good and the round manages to find a sweet spot in value as a multipurpose shooter, with potential in target practice, hunting, self defense and general fooling around. This is a 1000 round bulk case lot that comes sealed into two separate 500 round packs. Through 500 rnds and no problems at all. Works well with my AK.